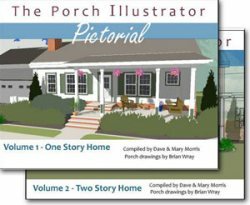 If you are looking for summer porch decorating ideas, welcome! 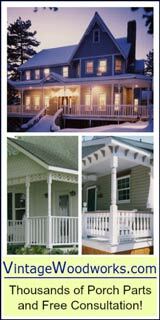 Do you enjoy changing out your porch decor as the seasons change (or the holidays come and go)? Dave and I are happy to share tips on how we do that. 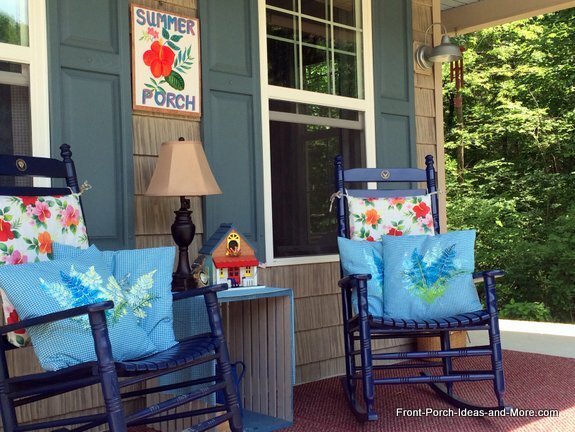 Summer porch decorating need not cost you a lot. In fact, you might not have to even go shopping. 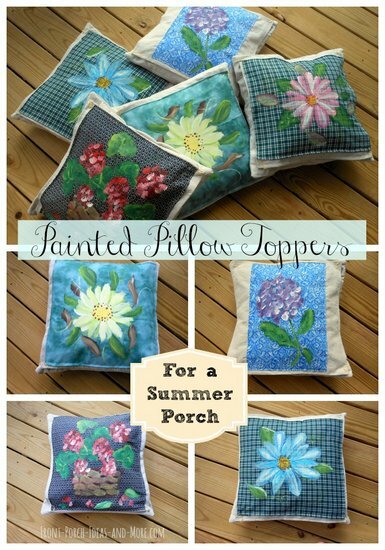 We hope you enjoy our summer pillow toppers that we did with a stencil. Yes, we used a stencil to create pillows that are very attractive. 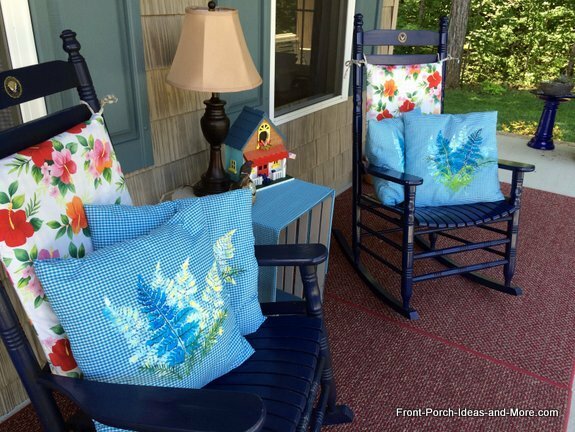 Dave and I are happy to show you the summer touches we've added to our porch: fern pillow toppers, summer wall art and a cute birdhouse that we painted. Let's begin with the stenciled pillow toppers. 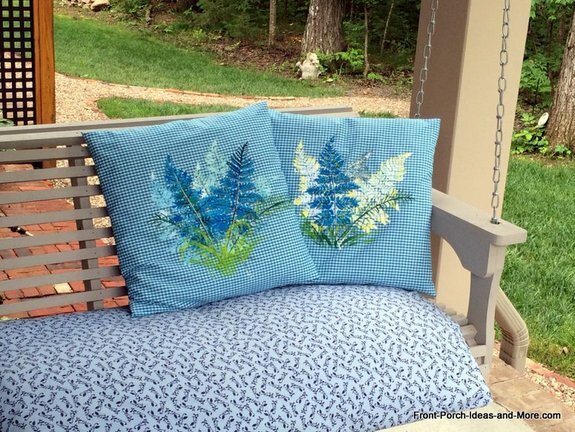 We have made pillow toppers in many different ways: painting, applique, just plain fabric, and now we're happy to show you how we did these pillows with stencils. Our first pillow toppers were these cute songbirds - a knock off from some pillows we saw at Plow and Hearth. For our newest pillow toppers, we used a stencil and some paint. 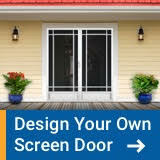 It does not need to be a stencil like ours. 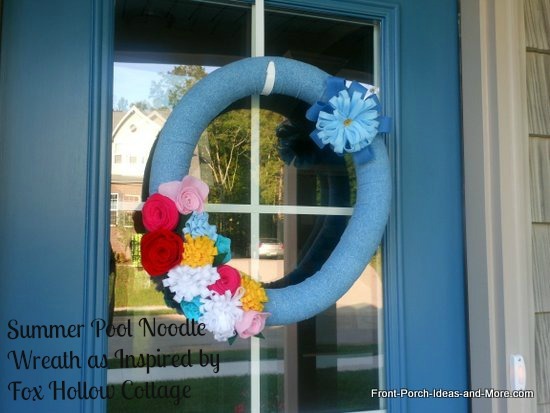 You may want to try something completely different like flowers, leaves or a medallion. A stencil is easy and yet it can look fabulous. We made ours look extra nice by stenciling more than once on our fabric and by adding some extra details at the end. 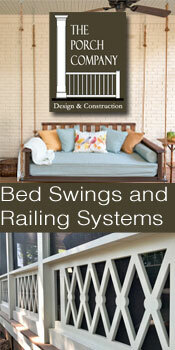 You can decide if you want yours to be super simple or a bit jazzed up like ours. 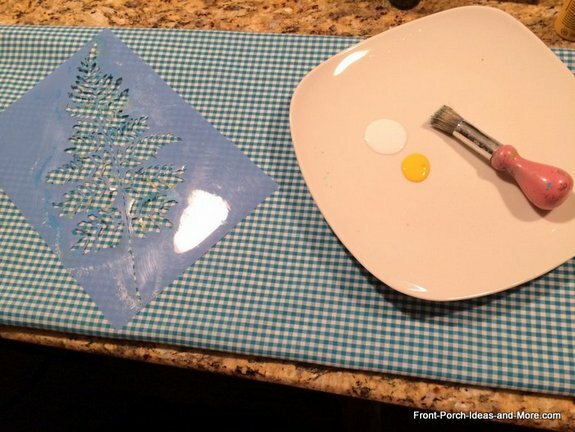 You will need a stencil of your choice, some fabric, some acrylic paints (ours are the dollar kind from the craft store), some stencil brushes or sponges and some plastic or paper to protect your work space. It depends on the size of your pillows, how many pillows you are covering, and how much of the pillow you want to cover. Our toppers wrap around to the back but they do not cover the entire back. So a half a yard per pillow worked for us. We covered four pillows. We purchased 3 yards of fabric (less than $3 per yard). 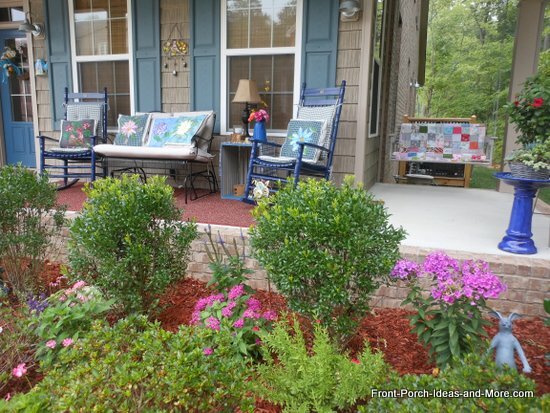 Two yards were used for the pillows and the extra yard as a small table cloth on our porch. If you want to watch a more detailed video to see how I stenciled the pillows, go here. 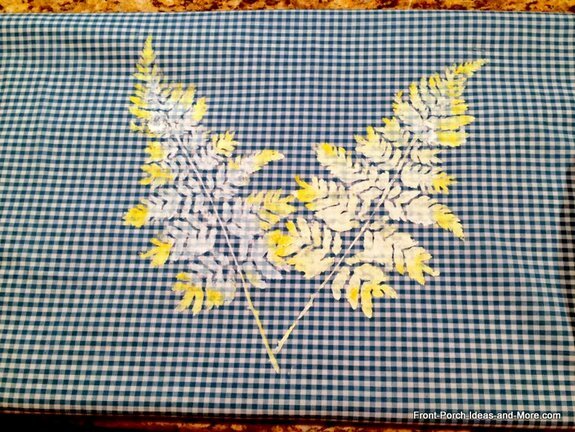 First, using our stencil we created a background on our pillow topper which adds depth to the design. We used white and yellow but choose the colors you like depending on the type of fabric you are using and what you enjoy. 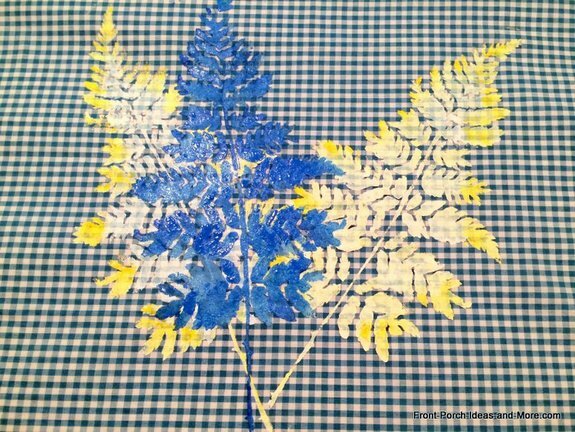 Once the background stenciling was fairly dry, we stenciled the predominant fern in bright blue. It's the one that stands out! 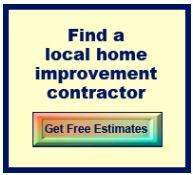 Now you could call your project done. Or you could add some finishing touches like we did. Optional finishing touches: I added some details like stems and veins to the leaves with a small pointed brush to the predominant fern. Why? Because it makes the fern "pop". I also sketched some additional fern leaves in green just for extra color and charm and added more background stencil. A pillow topper is an affordable way to change out your pillow covers for seasonal changes. And very attractively, too. 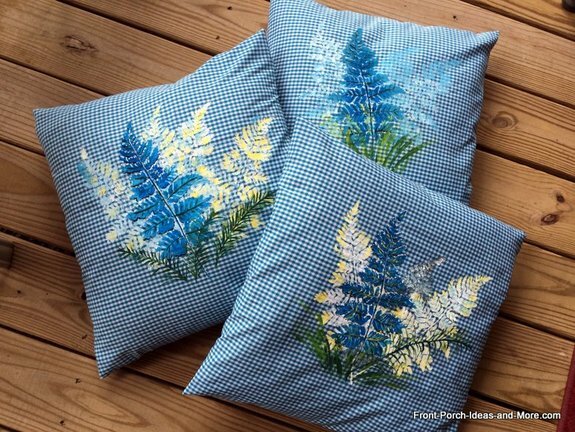 I cannot bring myself to purchase new pillows every time I want to update the porch. So making the pillow toppers is very fun for me - and I hope for you. And it need not be complicated either. First you can wrap your pillow topper around to the back of the pillow. Then fold back the raw edges. 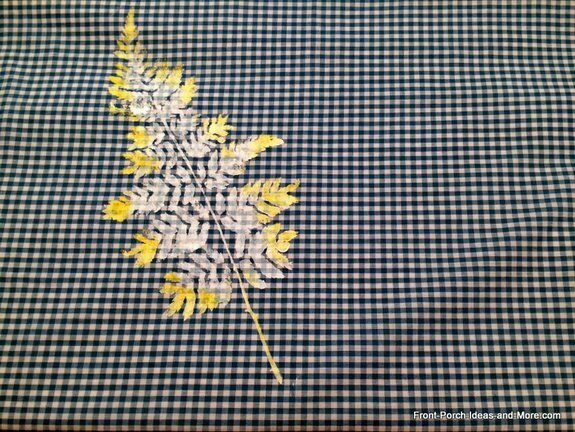 Baste the topper to the pillow with a simple running stitch around the back of the pillow. I do very long stitches so it only takes a few. Or instead of basting to the back, you can use safety pins. Yes, really I do this sometimes. It depends on how you use your pillows but ours are mostly for show. I am good at hiding the pins. You could even neatly duct tape the fabric on the back. I am not sure of the long term effects of duct tape on your pillow in hot weather, so just fyi. Another way is to make your pillow topper the same size as the front of your pillow. Then you could put a stitch or safety pin into each corner. This, too, I've done. 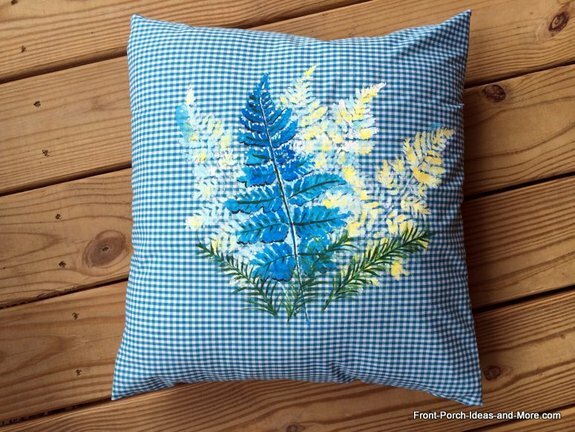 You can always make your pillow topper like a pillow case. Then just slide your pillow into it and fasten it closed on the one end. It's not hard to make it look tidy. 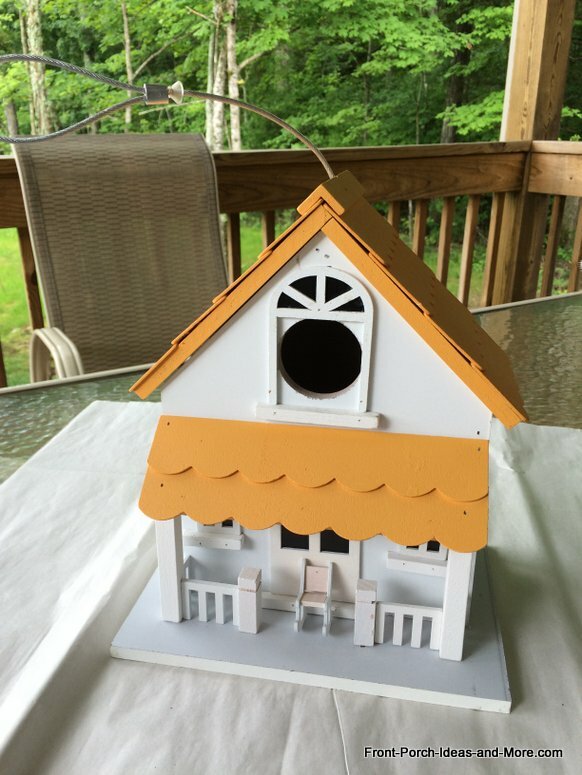 Our son's family gave me this decorative birdhouse for my birthday. I thought it would be fun to paint it. And so I did - see below. 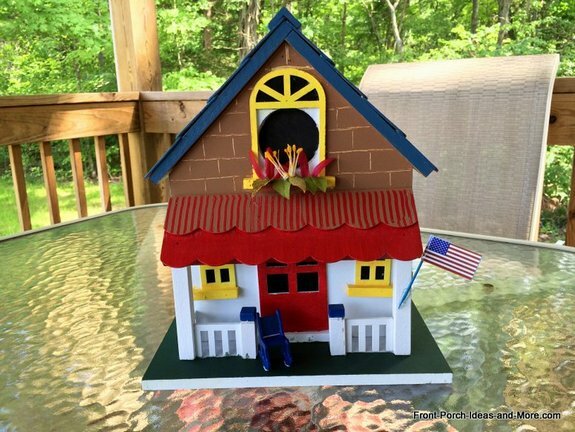 I painted the roof blue, the porch roof red, the windows yellow, the front door red the rocking chair blue and the porch floor green. What a difference that made. 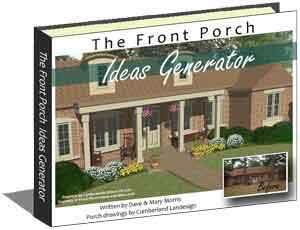 I have a nifty tool that enabled me to do the stripes on the porch roof. I painted it red first, let it dry and then painted tan over it. While the tan paint was wet, I dragged this tool across the wet paint to reveal the red underneath. You could do the same by just running a toothpick or popsicle stick down the wet paint to reveal the red background. 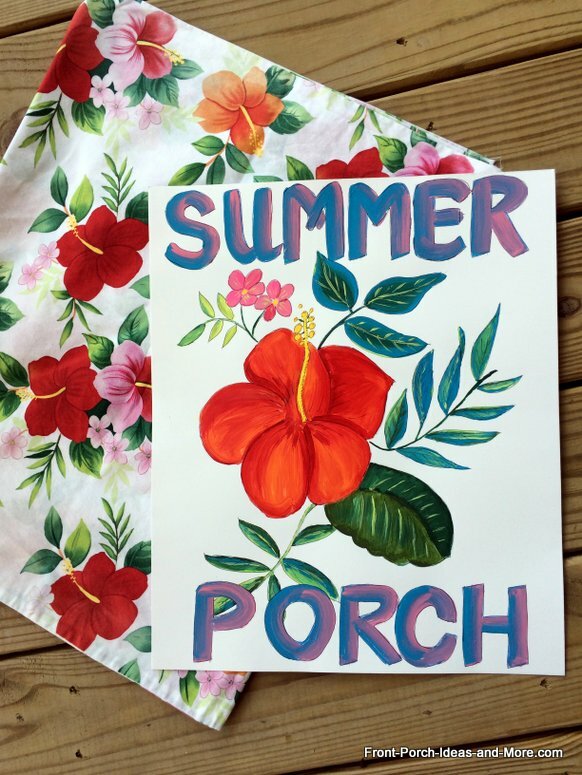 For our summer porch decorating, I painted this summer sign. I was inspired by the fabric on our cushions. We will give you a step-by-step soon, but now that I have done this my mind is buzzing with other ideas for wall art that hardly costs anything. 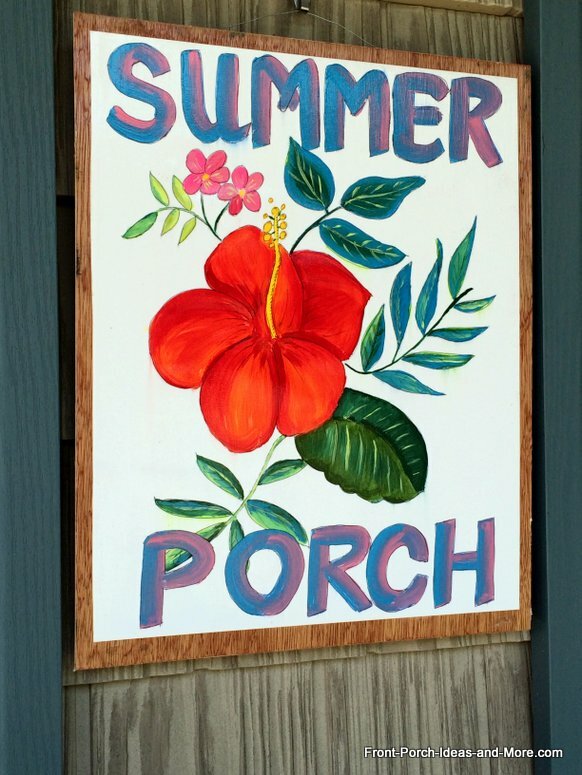 We hung the summer porch sign between our shutters. It adds a bright and cheery tone! Oh, remember how I commented about the fabric on our cushions? That fabric used to be curtains I made for my craft room. 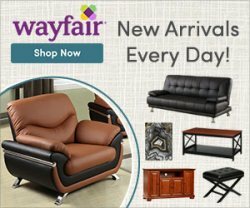 It is simply wrapped around our existing cushions and safety-pinned in the back. Easy-peasy bright and summery cushions. 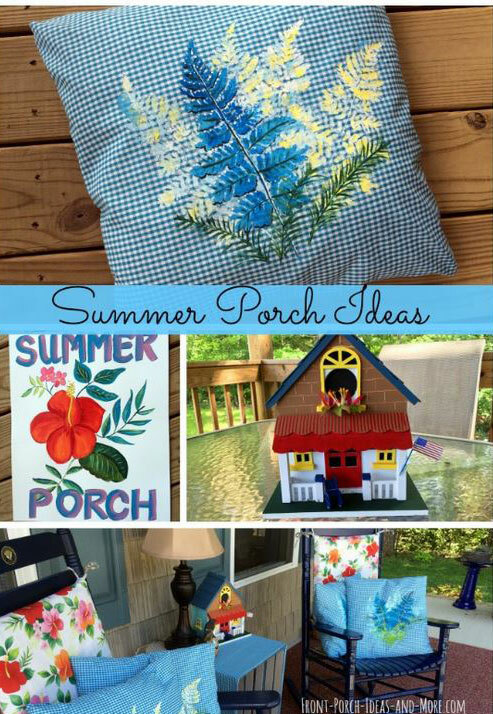 Did this post give you some summer porch decorating ideas? We hope you are inspired. 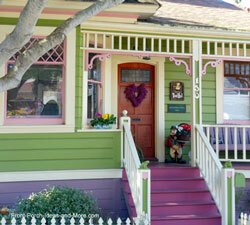 Do you have a good idea for decorating your porch? 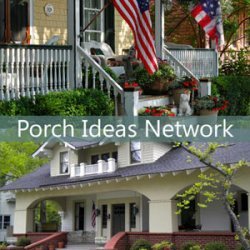 Send us your ideas so we can share it with everyone here.